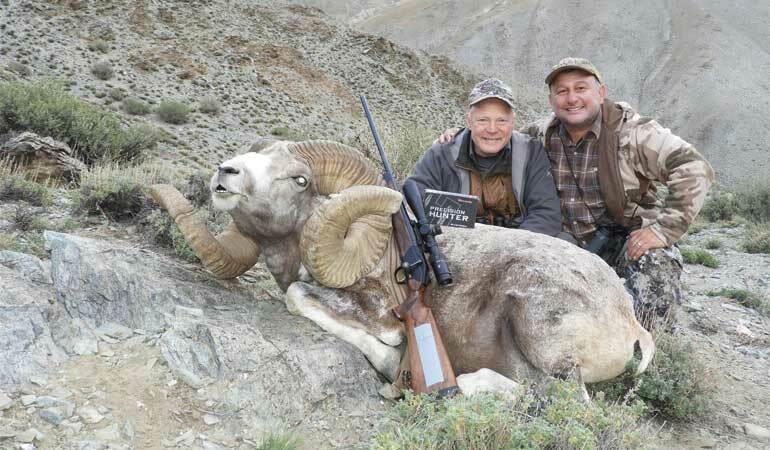 This Altai argali was taken with a Blaser R8 in .300 Wby. Mag. using Hornady 200-grain ELD-X, for several years Boddington’s favorite wind-bucking load for mountain game. I’ve missed myriad steel plates and lots of prairie dogs because of bad wind calls. The only way you can learn to read wind is to shoot in wind. Even with today’s gadgetry, from Kestrels and computerized apps to wind-compensating reticles, learning to compensate for wind is a trial-and-error business. This is because reading wind is much more art than science. Any detailed ballistics table, computerized or printed, can give you the deflection of a given bullet at a certain speed and distance. Such data usually starts with a 90-degree crosswind, but the difference as wind angles change can be calculated. So, with perfect data—and knowledge—wind deflection is a known value. Here’s where the art comes in: Downrange knowledge is rarely perfect. Wind direction and speed can change in matter seconds. And then there’s terrain, which channels wind current. Using smoke bombs, I’ve seen wind from three directions over a few hundred yards. Moving grass and leaves provide clues. Even then, it’s almost impossible to know that a 10 mph “full value” wind at the shooter has the same velocity and angle at a distant target. 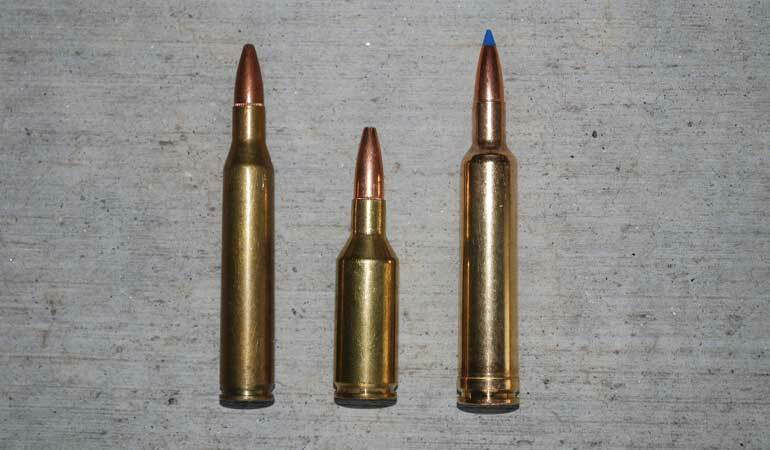 Left to right, .25-06, .25 WSSM, .257 Wby. Mag.. Cartridges of .25 caliber and below don’t hold up as well in the wind as 6.5mms and upwards. Velocity counts, so the fastest .25s with the most aerodynamic bullets do pretty well. Wind deflection is a direct linear function of wind velocity. At any given distance a 20-mph wind pushes a bullet twice as far as a 10-mph wind. And as distance increases, wind deflection increases dramatically. 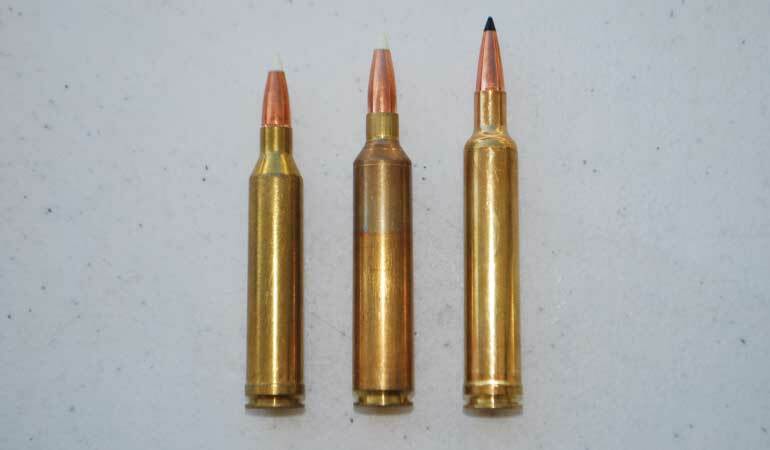 As a kid, and not knowing any better, I saw bullets from my .243 blown completely off of pronghorns. The biggest lesson was simple: As distance increases, if you aren’t reasonably sure about the wind you’d better not shoot. And if the wind is really strong, you’d better account for it even if the distance isn’t great. I can recall several shots where I’ve needed to hold completely off the animal. The last time I hunted in Quebec I shot a caribou in a gale-force crosswind. At just 200 yards I held on the animal’s tail to make a shoulder hit. Wind impacts every projectile, but not all are affected equally. 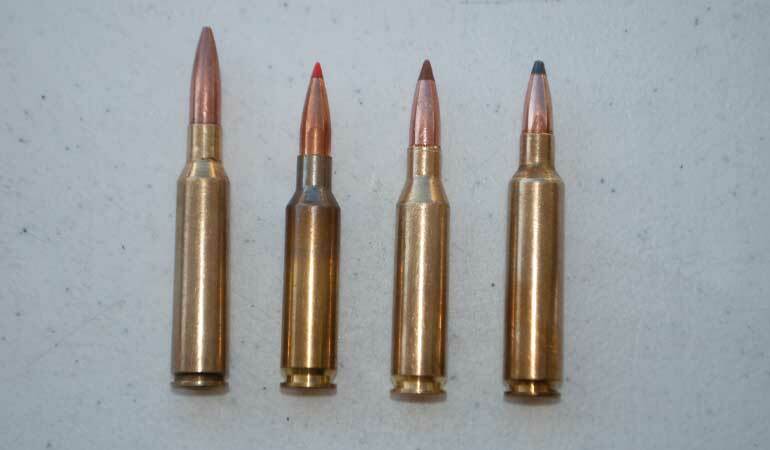 The variables are a combination of bullet velocity, ballistic coefficient and bullet weight. Velocity relates to time of flight: The faster the bullet, the less time wind has to work on it and thus has less effect. Left to right: .270 Win., .270 WSM, .270 Wby. Mag. Bullet selection in this caliber means they don’t measure up to the 6.5mms at extreme range, but at normal ranges they are just fine—and in some ways better than the 6.5mms. This applies throughout the flight path, so the race isn’t always to the swift. A bullet that is light-for-caliber but with poor aerodynamics may start fast but will slow down more quickly, and it can be more influenced by wind than a slower bullet that has a better ballistic coefficient and holds its velocity better. BC is an index of a bullet’s ability to overcome resistance in flight. The higher the BC the better a bullet holds its velocity and the better it resists wind. The most common comparison is the G-1 BC, based on comparison against a “standard” projectile. Expressed as a three-digit decimal, we think of a BC in the .400 range as “aerodynamic.” A BC in the .500 range is very aerodynamic. Today, thanks to interest in long-range shooting, we have a lot of bullets specifically designed for low drag with off-the-charts BCs into the .600s and, rarely, .700s. Projectile weight is also a factor. This is sort of a matter of inertia, but heavier projectiles are more resistant to wind. All reloading manuals list BCs. Pick one up and take a cruise. You will quickly see that, regardless of aerodynamic design, bullets of .25 caliber and below rarely reach into the .500s. They could be made higher by adding weight, but they’d become so long that overall cartridge length would become problematic. Left to right: 6.5x55 Mauser, 6.5mm Creedmoor, .260 Rem., 6.5-.284 Norma. The mild 6.5mms are the shooting world’s darlings today. Mild in recoil, they are superb long-range target cartridges, but they just aren’t fast enough to be extremely wind-resistant. At one time I thought the .25-06 had to be the world’s best pronghorn cartridge. But I’m also a huge .270 fan. Over time I saw too many instances on the windy prairies where .25s couldn’t hold their own, while .270s were able to get the job done. The sweet spot for this situation falls right about 6.5mm. This is not because 6.5s are inherently better, but ever since their debut in the 1890s 6.5mm cartridges have been designed to handle heavy-for-caliber bullets. Hornady’s 10th edition reloading handbook lists 11 6.5mm bullets from 129 to 160 grains. The 160-grain round-nose has a low BC of .283. The other ten are from .445 upwards. Six are above .500, two above .600. 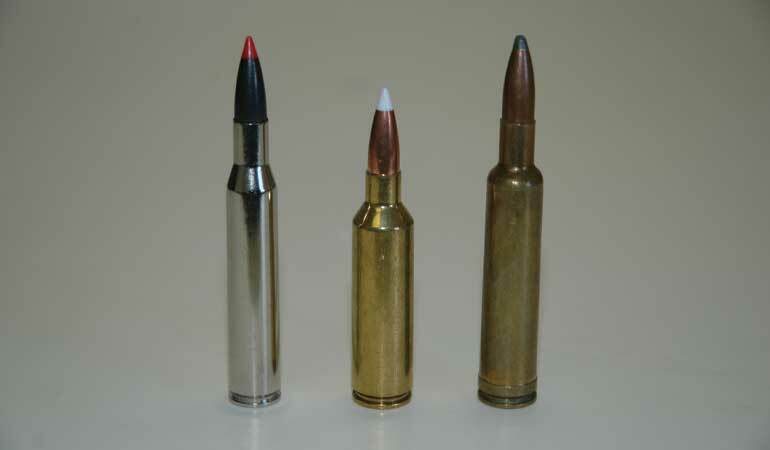 Consistent with other manufacturers, few projectiles of smaller caliber can compare. So if I wanted a cartridge for windy country and also wanted light recoil, I would choose a mild 6.5mm. It doesn’t matter whether it’s the 6.5mm Creedmoor, .260 Rem., or the old 6.5x55. I’d shoot a high-BC 140-grain bullet. However, this is not the whole story. While the numbers point to the 6.5mms at ranges far beyond most of us shoot at game, at normal hunting ranges the fast .25s and .270s do just as well. I ran a quick comparison on the Hornady Ballistics Calculator. At sea level, 59 degrees at 500 yards, a 10-mph crosswind deflects the 6.5mm 143-grain ELD-X at 2,700 fps—as from a 6.5mm Creedmoor or .260 Rem.—14.14 inches. Under the same conditions a .257-inch 110-grain ELD-X at 3,100 fps—as from a .25-06—deflects 15.0 inches. A .277-inch .145-grain ELD-X at 3,000 fps—as from a .270 Win.—deflects 13.74 inches. Left to right: .264 Win. Mag., .26 Nosler, 6.5-.300 Wby. Mag. Large-cased 6.5mms and add some velocity to an aerodynamic bullet, producing an extremely flat trajectory and great wind-bucking ability—with enough power for game at least up to elk. You can do better. By withstanding more recoil, you could put the 143-grain ELD-X into a .26 Nosler or 6.5-300 Weatherby and push it to 3,300 fps. Then you’d have just 9.62 inches of wind deflection. Combining velocity and the carrying properties of the 6.5mm bullet, this is about as good as it gets. A very aerodynamic 7mm (.284-inch) bullet, such as the 162-grain ELD-X from a magnum case at 3,000 fps, will drift 11.56 inches. For the last few years the .30 caliber 200-grain ELD-X has been a favorite for mountain hunting. I get about 2,900 fps in a .300 Wby. Chamber, and the drift is 12.85 inches. Clearly, without extreme recoil, we’re just about into diminishing returns. Remember, all these figures are with a 10-mph wind, visible as leaves moving and trees swaying. At 500 yards—which I consider far for shots at game—you’d have to hold off the vital zone to make a proper hit. Now, just supposing a 30-mph wind. The deflection at 500 yards goes way up. The vaunted 6.5mm Creedmoor with 143-grain ELD-X drifts 45 inches. Speed up the same bullet to 3,300 fps in a larger case and you cut the deflection to 30 inches. My own magnum .30 with the 200-grain ELD-X (BC .626) still has 41 inches of drift. At 500 yards a 30-mph wind approaches a no-shoot situation no matter what you’re shooting. Fortunately, most breezes aren’t that strong, relatively few winds are 90-degrees, and 500-yard shots are not always necessary. You can’t beat the wind. Fast cartridges with aerodynamic bullets help, but only so much. You can study the numbers and embrace the technology. These also help. But the only real solution to reading wind is to shoot and learn. Even with lots of experience, and with the best equipment available, there will be many times when you just don’t know. Ringing steel offers a great learning experience, and so does varmint hunting. Nobody gets it right all the time, but on big game you have to get it right the first time, which means that, regardless of your equipment, if you aren’t sure you just can’t shoot.